Why would I need self storage in Golden, CO? There are a variety of reasons why you might need self-storage in Golden, CO.
How much is a storage unit in Golden, CO? The cheapest storage unit in Golden, CO is $35.00 per month. What size storage units do you have available in Golden, CO? In Golden, CO we have sizes that range from 5'x4' to 10'x30' to suit your storage needs. How much is it for a 5'x4' storage unit in Golden, CO? The cheapest 5'x4' storage unit in Golden, CO is $47.00 per month. Known for its stunning scenery and growing businesses, Golden is a relatively small city in central Colorado. The city boasts a history of innovation, and is a popular home for people with a love for the great outdoors. With nearly 250 sunny days each year and proximity to the Rocky Mountains, there are plenty of opportunities to enjoy the local environment. Just 15 miles from Denver, Golden also makes it easy to access big-city amenities and jobs. The town of Golden originated as a gold rush settlement in 1859, quickly evolving into the political and economic hub of the region. Its convenient location made it a gateway of sorts between the east and the west, becoming home to many of the era's most important businessmen. 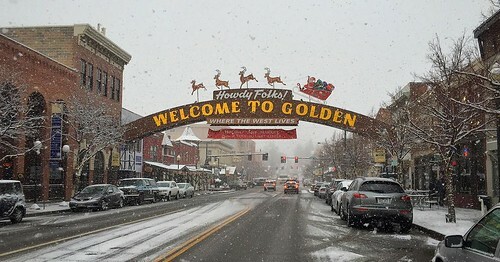 During the Civil War, the town's population decreased significantly for a variety of reasons, and Golden soon found itself in fierce competition with the city of Denver. Both cities fought for power in the territory, each hoping to earn the important asset of a major railroad. When Denver was chosen as the central city for the railroad connection, the people of Golden turned their attention to fueling the city's industry and economy instead. Trade and industry flourished, and Golden became home to three colleges and a handful of cultural institutions. The city managed to emerge from the Great Depression fairly unscathed thanks to its strong economy, later experiencing a significant population boom after World War II. Golden has become an in-demand location for breweries, renewable energy and a variety of other companies. Coors Brewing Co.and CoorsTek are just two of Golden's largest employers, along with National Renewable Energy Laboratory, energy consultant Innovative Services and machine wholesaler PMC Technology. Golden and the greater Denver metro area welcome a wide range of industries, with the largest being professional and business services, trade and transportation, government, and education and health services. These industries are an excellent place to start if you're going to be searching for a job in the city. Jefferson County Public Schools manages the elementary, middle and high schools in Golden. The district offers choice enrollment, which means that your child can attend any Jefferson County public school with available space. There are a handful of private schools in Golden, including Montessori and faith-based campuses. The Colorado School of Mines is just a short drive from downtown Golden and is the oldest public university in the state of Colorado. Utilities: The city of Golden manages public water and sewer services, while Xcel Energy is the city's major energy provider. Garbage and Recycling: As a resident of Golden, you have the freedom to choose your waste disposal company. It can be helpful to ask your neighbors or community association which company serves the majority of homes in your area. Transportation: There are a variety of options for transportation in Golden, including light rail, Zipcar and the Call-n-Ride Bus. If you're looking for the most affordable homes in Golden, you'll generally find options in the center of the city, near the intersection of Highway 58 and Washington Avenue. Midrange and upscale homes are scattered throughout the city, with the largest homes on the city's north side. Median home prices in Golden are higher than the Colorado average, as are average rent prices. Our lowest priced units in Golden, CO average $47.00 per month. 389 people have reserved units in Golden, CO in the past 30 days. There are 7 locations within Golden, CO's city limits. There are 4 locations in Golden, CO that offer AC and Heating features.